Discover your true interior design style and create the home you love while saving time, money, and gaining confidence! InDeZo: The New Language of Interior Design, is based in Jeannie Marini’s proven “Design Zone” system, and is now available as a book and in a new iPad app. InDeZo knows that creating a home you’ll love begins with YOU, not the sofa. Drawing on her years of experience as an interior designer and educator, Ms. Marini guides readers step-by-step in creating their personalized design styles and vision for their homes. InDeZo brings this intuitive, personalized, and proven interior design program to everyone via this book and the new app. InDeZo is a new way of understanding yourself by revealing what you love. It’s simple, easy, accurate, and fun! It’s not based in trends, which are fun, but they come and go. You are not a trend, and neither is your home. You have a special style that reflects who you are in a timeless way, and InDeZo will help you identify the ambiance or feeling in a room that you love best. It all begins with you. Who can benefit? We think everyone! Interior designers, decorators, real estate agents, DIY’ers, home decor enthusiasts, bachelors, new homeowners, and yes, even the design-challenged. Professional interior designers use InDeZo with clients, and there’s an entire chapter devoted to helping professionals in the design industry. The design-challenged refer to InDeZo as “interior design therapy”, and yes, InDeZo is for guys, too. Designing a home you’ll love is just an InDeZo step away, with a system that reveals your true intuitive style, while providing thorough descriptions, guideposts, and specifics that help you feel more confident. The book also includes suggestions in choosing the colors, fabrics, and décor that will help you design with confidence and clarity in your InDeZo style. 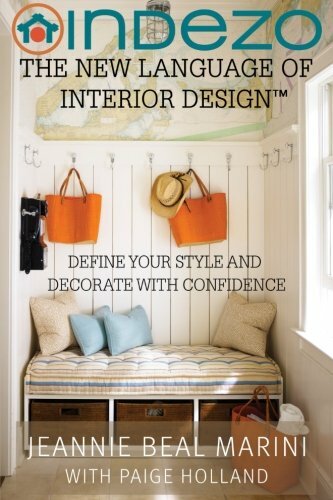 “Within the InDeZo book you will find soulful wisdom, wonderful direction, clarity, encouragement, and specific guides to help you find your unique interior design style, and then begin the journey of creating it.” - K. Saunders “Such a cool way to identify styles that you like! It’s fun, easy, and it gives you great ideas on how to design your dream home’s interior!” DellSpa “…it’s like therapy for those of us who are design challenged.” Tweet If you long to create a home that you love living in with a new found clarity and confidence – this book is for you. If you’re a design professional, real estate professional, coach, or therapist, this book is for you. If you are design-challenged with no idea how to decorate your home or apartment, this book is for you.